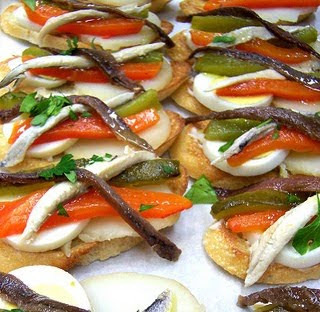 If luck landed you in San Sebastian, Spain, for a night on the town, you’d probably begin with pintxos (pronounced pean-chos). The bite-sized snacks, usually served on thin slices of baguette, line Basque bars—so you can nibble Spanish tortillas (potato omelet) or marinated mushrooms while sipping a Rioja red. As Spanish flavors make their way stateside, pintxos are increasingly common in the United States. New York City has a restaurant named after them, and Contigo recently opened in San Francisco to dish up single servings of chickpeas and anchovies. Even Denver has its own pintxos spot. In late October, Kurt and Deicy Steinbecker, graduates of San Sebastian’s La Escuela de Cocina Luis Irizar, and long-time cooks in Spanish kitchens, opened Ondo’s in Cherry Creek North. Their ground-level restaurant serves up the Basque snacks just as you’d find them on bars in San Sebastian. Thin slices of mango, wrap creamy tuna, and sit atop toasts. Generous servings of salmon pate cover thin slices of bread. The Steinbeckers even offer bites of Spanish omelets. But these ultra authentic snacks come at a cost. Since the couple imports all its product from Spain, its pintxos price out higher than they would in Europe. (Think $5-$9, instead of $3-$4.) Which makes Ondo’s a happy hour destination. From 4 to 6:30 p.m., Monday through Friday, all wines and a few pintxos are $2 off. Those authentic prices fit the real Spanish eats. For more information on the emergence of Spanish flavors in the U.S., check out the Cultural Curiosity section of Shifts 2.0.